At the Liberal Party of Canada biennial convention in Montreal in February 2014, party members voted on a number of policy resolutions. Of particular interest to me was the resolution to reject the 1969 White Paper on Indian Policy, whose authors included Prime Minister Pierre Trudeau. Here is a snapshot of the 1969 White Paper from the 4th edition of our book, Working Effectively with Indigenous Peoples® and below this, is the actual wording of the resolution to reject the 1969 White Paper. “In 1969, the government of Canada introduced a White Paper on Indian Policy, which called for the removal of the Indian Act, the transfer of reserve lands to individuals, and the removal of the federal government’s fiduciary duty. It was regarded as the final instrument in the long standing policy of Indian assimilation. Aboriginal leaders vehemently opposed the imposition of the White Paper recommendations as they believed the recommendations would result in significantly worse living conditions than those that existed in the era that followed the Residential School debacle. 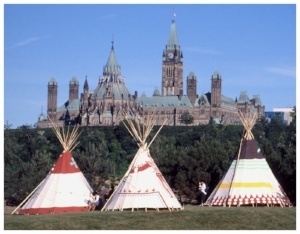 Confronted by Aboriginal opposition to the White Paper from coast to coast, the federal government withdrew the initiative in 1971, replacing it with the “Core Funding Program” – supplying Aboriginal groups with resources to promote their causes through research, publication and legal action. BE IT FURTHER RESOLVED THAT the Liberal Party of Canada will not repeat the mistakes of the past and strive for meaningful consultation when considering legislation and policy that impact the rights of Indigenous peoples. It will be interesting to see the reaction of Aboriginal Peoples of Canada in the days and months ahead. From a working effectively perspective, there is much value in relationships and to maintain them on occasion requires acknowledgement and a commitment to move forward in new way both of which we see reflected in the Resolution. I believe practitioners can apply this acknowledgement approach to everything they do as opposed to trying to ignore or deflect problems. If you are interested in learning more about the history of Indigenous Peoples and how it can impact your engagement, check out our Indigenous awareness training. We also offer Working Effectively with Indigenous Peoples® and Indigenous Consultation and Engagement™ training onsite throughout the year and during Training Weeks in major centres.